Containing a high concentration of glycerin, O’Keeffe’s for Healthy Feet® draws in and retains moisture, which is necessary for healthy-feeling, hydrated skin. Our Healthy Feet Foot Cream contains increased levels of Allantoin versus Working Hands® Hand Cream. The formula helps to penetrate thicker and rougher surface skin on the feet. 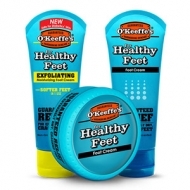 Best of all, O’Keeffe’s for Healthy Feet Foot Cream works fast. Most people start seeing improvements in their dry cracked feet in only a few days. 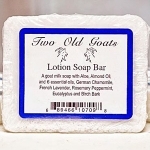 Two Old Goats Arthritis & Fibromyalgia Essential Lotion is our strongest formula, ready to tackle your toughest aches & pains caused by swelling due to arthritis, fibromyalgia, gout or injury. Our goat's milk base carries our natural blend of 6 essential oils deep into your joints and muscles.